The jail population in New York is the lowest it’s been in 31 years, according to a report that City Comptroller Scott M. Stringer released on Friday. However, the more money the city’s correctional department seems to spend, the worse things seem to get inside the city prisons. “The Department of Correction is pouring huge amounts of money into this problem, but we aren’t seeing any real results or improvements,” Stringer said. 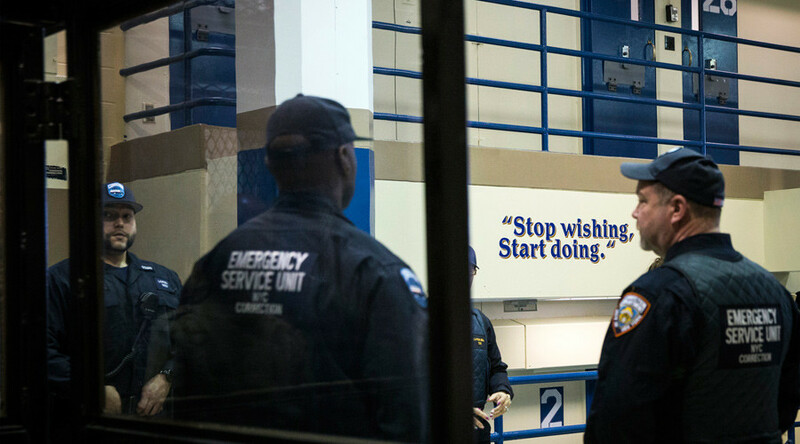 Stringer’s new report is a follow-up to a 2014 investigation that was prompted by a number of fatal incidents at Rikers Island and other facilities. At the end of last year, the city adopted new practices and guidelines to help improve prisons, including the re-branding of solitary confinement cells as “enhanced supervision housing” (ESH) units. Subsequent reforms introduced more security cameras and programs for inmates. Last month, the City Council passed several bills mandating new reporting requirements, aimed at greater transparency at the Department of Correction. Inmate fights and use-of-force incidents had decreased since January, Monica Klein, spokeswoman for Mayor Bill de Blasio, told Reuters. She added that better training was also having effect, as there were fewer serious injuries in cases where guards used force. Stringer’s report, however, paints a different picture. Measured against the average daily population (ADP), the rate of fights and assault infractions has increased 19 percent over the past year, from 774 to 920. 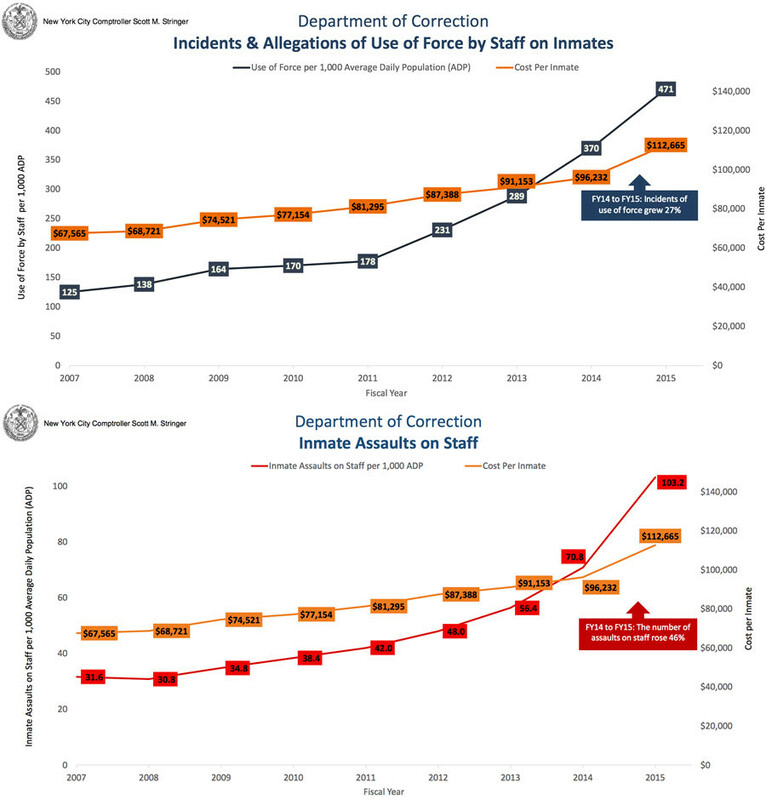 Assaults by inmates against prison staff went from 70.8 to 103.2 since 2014, an increase of 46 percent. Prison staff also used force 27 percent more often than last year, with 471 incidents compared to 370 in 2014. Agency-wide overtime expenses per inmate have risen by a “staggering” 57 percent, Stringer’s report noted, even as the number of uniformed officers decreased by 166. 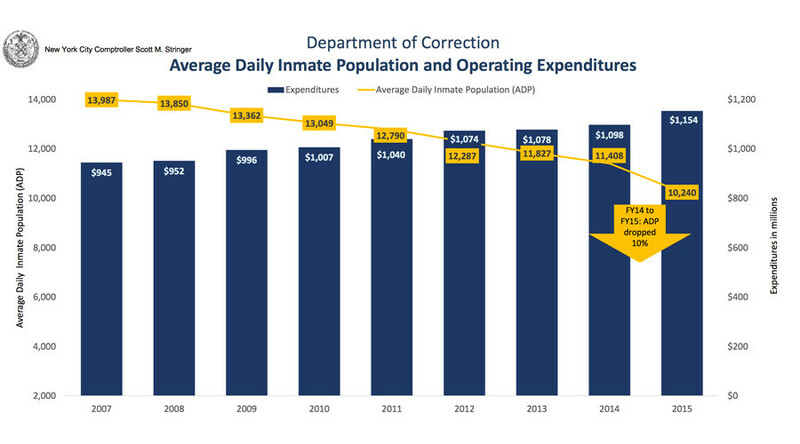 Meanwhile, the cost per inmate rose by 17 percent, from $96,232 in 2014 to $112,665. This is the largest annual percentage increase in at least three decades, the report said. The average daily number of inmates is 10,240, down 10 percent from 2014 and the lowest it has been in 31 years. Even before the spike in costs, New York City was spending more per inmate than Philadelphia, Pennsylvania; Chicago, Illinois; Miami, Florida; and Los Angeles, California, the report found.